Use the IW-16PLUG with the IWM-BPG, IW-BPG, or IW-BG series in-wall jack plates. 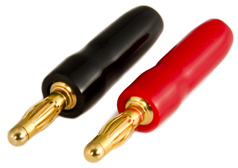 The IW-16PLUG bananas can be used on both sides of the IWM-BPG series jack plates for a fast and clean installation. 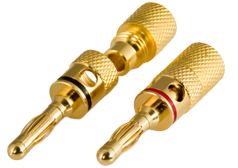 The IW-4PLUG (Solderless compression screw-on type) These plugs use a thumb-screw compression-connection to secure the wire. Use the IW-4PLUG with the IWM-BPG, IW-BPG, or IW-BG series in-wall jack plates.